Our annual SWE PNW Section Awards program recognize SWE PNW members who exemplify the SWE mission, vision, and core values at the local and section level. All Section Awards are peer-nominated, taking suggestions from current SWE PNW members, and presented to the SWE PNW Executive Council for final selection. ​A peer-nominated award that recognizes a SWE PNW member for their work with and supporting the Section. ​Person that made a significant impact on the overall Section leadership, development, and/or growth. This awards recognizes SWE PNW members that step up in specific focus areas​ to support leadership, development, and/or growth within that focus area. 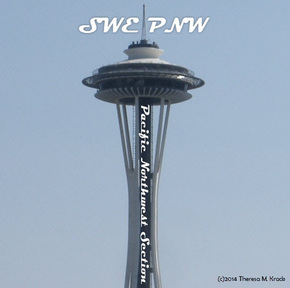 Person that actively participated in or planning of outreach events sponsored by SWE PNW. ​Person that actively planned, supported, and executed SWE PNW professional development events. Person that supported the behind the scenes of SWE PNW through the development and/or maintenance of the section's digital platform and/or infrastructure. Note: An asterisk (*) indicated the inaugural year that award was granted by the section. Prior to the launch of the current Sections Awards Program, different awards and recognition were presented at our annual banquets. We've collected those here to continue to recognize members across the years that have help make SWE PNW the successful section we are! Our updated Section Awards Program nomination form is below or at this link! Having trouble or have questions? Please contact ​swe.pnw.awards@gmail.com.